On this week’s edition of ‘Throwback Thursday’ we will look at current Red Sox first baseman, and World Series champion, Mitch Moreland. Moreland, the Smithville, Mississippi native, played two seasons for the Bourne Braves in 2006 and 2007 in between his collegiate career at Mississippi State. Moreland has had quite the career in the Majors, as he is currently in his tenth season on his second team. Moreland played seven seasons with the Texas Rangers before coming to Boston in 2017. During his career in the Cape Cod Baseball League, Moreland found himself playing most of his games as a first baseman where he still plays today. Moreland also saw action in three games in the outfield for Bourne in the 2006 season. The power hitter also tested himself on the mound as he had an 0-1 record in seven appearances that lasted nine innings. Moreland tallied 33 hits, 4 homeruns, and hit .239 in 43 games in the summer of ’06. During the 2018 player’s weekend in the MLB, players chose their nicknames for three games, Moreland chose “2-Bags” in reference to him being a great double hitter. This was true for years before his MLB debut as he hit eight doubles in 2006 to lead Bourne. Mitch Moreland was left off the All-League team as Justin Smoak took the spot for best first baseman of the year. Smoak currently finds himself battling against Moreland a lot in the MLB as he is the current first baseman for the Toronto Blue Jays. Moreland followed up his 2006 season by returning to the CCBL in 2007 to partake in his second and final season with the Bourne Braves after his junior season at Mississippi State. Moreland appeared in 24 games, notching 22 hits, three homers, and hit .268. Moreland again found himself on the mound that summer, but had a slight innings restriction as he pitched seven innings combined in seven appearances. 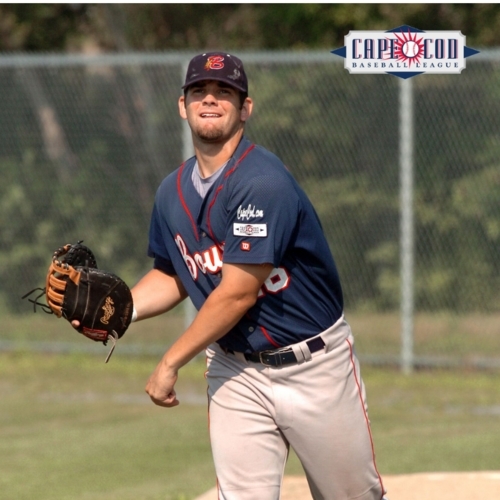 Besides being a great player on the field, Moreland was also a great man during his time in Bourne playing in the CCBL. Moreland is commonly referred to as one of the nicest men to ever play their summer ball down the Cape. In an article by Peter Gammons, Gammons asked the group of host families for the Bourne Braves to name the nicest player they’ve hosted, and it was a unanimous answer: Mitch Moreland, summer of 2006.